Having read through this thread, I realize that after I'm finished with Giulini my next conductor binge will be Szell. His late Mozart symphonies are the best I've heard. His Beethoven symphonies are solid. That's pretty much all I have. George Szell as composer. Someone at the Art-Music Forum posted a recording of his Piano Quintet op.2 (1911 according to IMSLP when one can find the score + parts). As a by-the-way, the same post reveals a recording of the Bartok Piano Quintet which is pretty impressive and the Antal Dorati Octet which is - unusual. A few Szell items that don't seem to appear in the new big so called complete Szell box. My discography of Cleveland recordings lists only one Don Juan conducted by Szell (March 1957). Maybe you've seen or heard a live version? He did record Till three times! Actually, the first recording Szell ever made is not attributed to him. He was an assistant to Richard Strauss when Strauss was scheduled to record Don Juan. Strauss was late and the musicians were waiting, so Szell stepped in to start the performance. He did the first have of the work when Strauss finally arrived. Strauss conducted the second half and then listened to the already recorded first half, and said it sounded fine to him, and approved its going out to the public under his name. Nonsense, that merely gives you special expertise. But don't slight the non Sony Szell; there is his evil twin brother EMI Szell. The recording I have from the evil twin brother is Des Knaben Wunderhorn, with Schwarzkopf and Fischer-Dieskau as the soloists--which alone should tell you how good it is. You don't have to be from Ohio to think Szell was one of the greatest conductors who ever lived. I am from Chicago, and I have called myself a Szellot since the late 1960's. His cycle of the Beethoven symphonies is one of the essentials (one word of warning--the second movement of his 7th Symphony is the worst performance of a single movement in his set. I especially like his 6-9, (except for the Seventh's 2nd movement). I never particularly liked his Mozart with Serkin, but his Mozart with Fleisher (PC 25), and with Robert Casadesus are excellent. That first 6 of the Haydn London Symphonies is good, too, and his Brahms PCs with both Fleisher and Serkin (the Fleisher is better). I like his cycle of the Brahms symphonies, but mostly for his Third, and for the two overtures and the Haydn Variations, which I think are the best recordings of those works. His Schumann Symphony cycle is one of the essential ones, as is his CD of the last two Schubert symphonies. The Dvorak 7, 8, & 9 are excellent, esp. 7 & 8. His Prokofiev PCs 1 & 3 with Graffman are essential, as is the disc with R Serkin of the Bartok PC 1 and the Prokofiev PC 4 for left hand. A CD is out with the Prokofiev 5th symphony and a Bartok Concerto for Orchestra--this last has an alternative ending authorized by Bartok which no other conductor uses, so it is essential to a complete Bartok collection. And then, I have another one of the Grieg Peer Gynt Suites, Bizet's L'Alresienne Suit 1, and Mussorgsky's Pictures. Just think about Szell and the Great Gate of Kiev, and your mouth should water. Is his Beethoven Symphonies cycle OOP? You might want to update your Churchill quote ..... he actually said .... "Success is the ability to go from one failure to another with to no loss of enthusiasm" . Related to this, he also said "Success is not final; Failure is not fatal; It is the courage to continue that counts". Another favourite is "If you are going through Hell, keep going!" I've only just seen this nine years late! Sorry about that. However your version of the quote doesn't, in itself, make sense. Not sure where I got mine from but think I'll stick with it. These are pretty common and I think any Szell fan should own these. The Sibelius 2nd is likely one of the most stupendous recordings of this work I have heard. The transition to the final mvt, those trumpet calls, and the body of the strings are all demonstration class in orchestral execution. When George Szell died, in 1970, he was revered for having built the Cleveland Orchestra into one of the world’s great ensembles in a 24-year tenure that began in 1946, and as an interpreter whose streamlined but high-power readings were rooted in his belief that a composer’s intentions were sacrosanct. But though he played down the Romantic notion that interpretation should also reflect the performer’s personality, Szell’s readings were always identifiable by their structural logic, textural clarity, unerring balances and sheer energy. Under Szell’s baton, an orchestra was a highly polished, precision machine, and in music by Beethoven, Schubert, Brahms, Dvořák and Wagner, he was untouchable. Yet, at the time of his death, the music world as Szell knew it was hurtling toward obsolescence. One of the last great podium martinets, Szell wielded absolute authority and executed it with severity—an approach that vanished once unions began asserting themselves in matters of how musicians should be treated. Vanished, too, is the kind of devotion Szell showed to the Cleveland Orchestra. These days, a tenure lasting nearly a quarter century is rare; beyond a decade, critics wonder (often abetted by off-the-record carping from the players) whether the relationship is growing stale. Szell’s, with Cleveland, never did; the chemistry between them consistently yielded both heat and light. 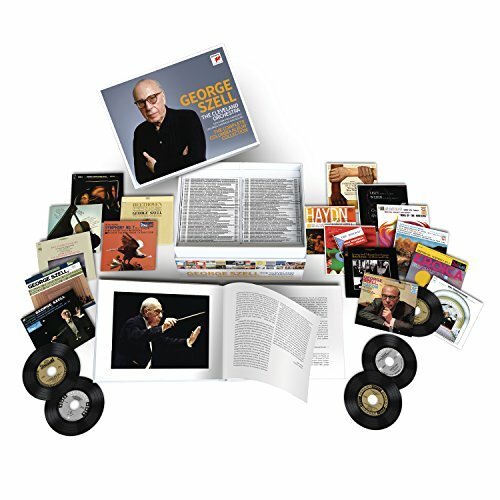 Their recordings for the Epic and CBS Masterworks labels, starting in 1947, were exemplary in their day, and they remain so now, a point Sony Classical makes vividly in its 106-CD “George Szell: The Complete Columbia Album Collection,” out now. Except for some live recordings issued by the orchestra itself, all of Szell’s Cleveland recordings are here, along with a few Szell made with the New York Philharmonic, the Columbia Symphony Orchestra, and as a remarkably vibrant chamber-music pianist. The discs are beautifully remastered, and packaged in sleeves that replicate their original artwork and liner notes, with period-correct labels and a hardcover book that provides all the recording details. Mammoth boxes like this, which have become plentiful lately, are the last gasps of the physical record industry, intent on presenting its wares as they were in their heyday, one last time before streaming blows away the tactile side of music collecting entirely. They are comprehensive, relatively inexpensive (the Szell set can be had for less than $2 a disc) and provide the eerie sense that you are holding the full shape and substance of a great musician’s career in your hands. The Szell box is a fascinating glimpse at how the supposedly ossified classical canon has evolved (albeit slowly) over the decades. There is, for example, very little Mahler or Bruckner, indispensable staples of a conducting career now. But what there is—most notably, a rich-hued 1966 Mahler Fourth Symphony, and a broad-boned 1970 Bruckner Eighth—stands up well to modern competition. It is also hard to imagine a conductor today recording 106 discs with only a handful devoted to contemporary music and, of that, only a single Stravinsky work, the “Firebird” Suite. Yet when Szell considered a new work worth recording—for example, a spiky, high-contrast account of Samuel Barber’s Piano Concerto, with John Browning; or taut, colorful performances of Walton’s Partita for Orchestra and Symphony No. 2; or a curious reading of Bartók’s Concerto for Orchestra that begins sedately but eventually explodes from the speaker—he is an eloquent advocate, as focused on detail, balance and the subtleties of color as he is in the great Romantic works. There are occasional disappointments that have more to do with changing interpretive fashion than with any deficiencies of Szell’s. His Mozart, Haydn and Bach, for example, sound a bit ponderous by today’s standards. And despite his reputation as a literalist, he often jettisoned exposition repeats, arguing in interviews (several are included in the set) that repeats were necessary only when works were new and audiences were unfamiliar with them. Szell’s specialty was the Romantic repertory. His Beethoven and Brahms Symphonies remain among the most tightly reasoned and precisely executed on the market, and his collaborations on those composers’ piano concertos, with Leon Fleisher, are still the gold standard. It’s not easy to find a recording that captures the same level of urgency and anxiety Szell brought to Strauss’s “Death and Transfiguration,” and his Wagner Overtures are truly regal. Even pieces that, today, are typically curtain-raisers or encores— Rossini Overtures, the Dvořák “Slavonic Dances”—have an uncommon intensity that makes them sound like major statements. Lately, the sweep of reductive history has elevated Arturo Toscanini, Leonard Bernstein and Herbert von Karajan to almost mythic status, leaving the other great conductors of the 20th century as footnotes that only specialist collectors care about. That’s not how it seemed at the time, of course. And the new Sony box is a reminder, disc for disc, that Szell deserves a place in that pantheon. —Mr. Kozinn writes about music for the Journal. Here is the set on Amazon, the incompetent source for classical music! And why "incompetent" you ask? I suppose you could turn it into a guessing game! I don't know how Amazon doesn't deserve anything other than praise for having this set at such a reasonable price when on Ebay you have to pay $100 or more for it. Who goes to Amazon for correct classical music info anyway? Amazon wants $221.00 for the set. And I agree that nobody goes to Amazon for classical music information, but they should offer correct and full information on the products they are hawking. Sorry I meant on Ebay the set costs $100 more than what Amazon is asking for. Even if you don't want it that badly it might be wise to buy it as it can easily go OOP in a matter of weeks. You can at least sell it for several times that. They do offer correct, if not full information. I think those who care enough will find that info elsewhere, I am not terribly bothered by it. In fact as a Szell fan I enjoy looking those tracks and trying to figure out what piece it is. Some recordings not mentioned in the review above: an album of orchestral excerpts from Der Ring by Wagner from the late 1960's. Fantastic performance! I recall reviewers begging Szell to record the full operas with the Cleveland Orchestra, as a result of this recording. Also, the four symphonies of Robert Schumann are highly recommended: they are contenders for the best ever! The Cleveland Orchestra site has the contents also. Some of the cds are very short on runtime. I think if they tried they could have fit everthing on 60 cds. My opinion of his music-making is mixed, but tilts to the favourable, with some really mythic musical bull’s eyes. If I was to retain 3 discs from his considerable output, they would be the Dvorak Slavonic Dances, the Strauss Don Quixote and the Sibelius 2nd (Amsterdam or Cleveland in Tokyo - different orchestral cultures at work here).